I’ve been a few times to this new Beechwood Avenue restaurant, but still not sure what they’re up to with the name. I’m not even sure how it’s written — is it Sushime, SushiME, or even Sushi Me? I believe it’s a play on producing tailor-made dishes. “Have it your way,” as they say. Or used to say, back in the day. The menu’s combo sushi items have titles like VEG ME, SPICY ME, MARU ME, MORI ME, HARU ME. And then there’s the TAM-AVO roll, the ACU-AVO roll, the TOMYUMMY soup. How these translate onto the plate requires a bit of fine-print reading and some reflection and, for me, a lot of questions. Fortunately, the two servers I’ve met at Sushime have been patient and kind, and the figuring out has been pretty tasty, the idea of having to make return visits a pleasure. Sushime has moved into a former real-estate office quite close to the Vanier Parkway. It’s been painted wasabi-green, to match the chairs, with an accent wall of dark grey, and with warm bamboo-tones on tables and sushi counter. (I’d only suggest Sushime turn off the commercial radio station and dim the lights; it’s bright for dinner, and the ads don’t help the atmosphere.) They’re still working on a liquor license. For now delicious genmaicha (brown rice tea) in pretty pots will have to do. The sushi bar is manned with obvious skill, and whoever is cooking in the semi-open kitchen knows her stuff. I’ve eaten very well, though only scratched the surface of what’s on offer. The menu is long and busy. It starts with bento boxes (served with miso soup and choice of vegetable pancake or gyoza) and combo sushi (served with miso soup). There are hot appetizers — some Korean, some Japanese — followed with sushi rolls, and some special Korean house rolls, and then noodles and rice dishes. The back page lists nigiri sushi and desserts. They’ve chosen cute and colourful over user-friendly, but since it all eats so well, I’ve forgiven them. By way of a prelude I’d start with a bit of sashimi (the cuts are exact, the fish fresh-tasting) and then move on to the house gyoza. 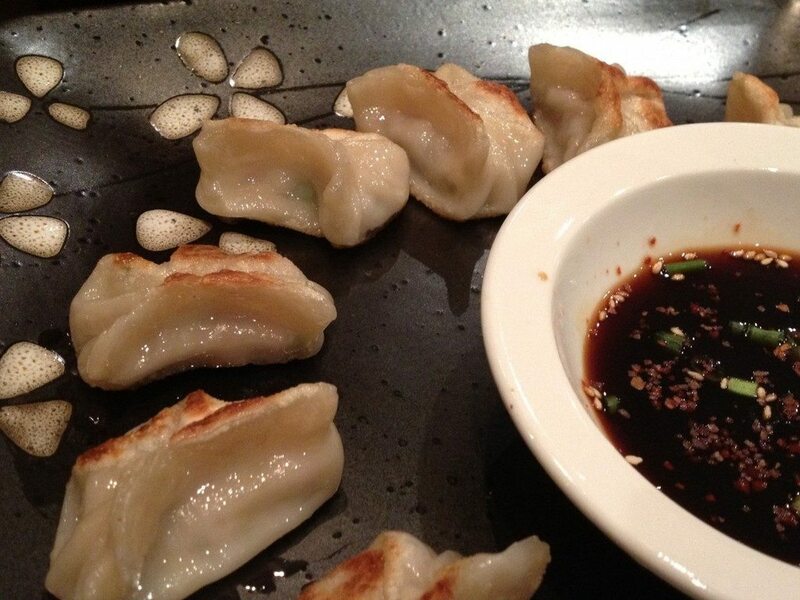 These are delicious dumplings, soft, slippery pockets of pork and green onion, steamed and browned on one side. The Korean scallion pancake, pajeon, has red pepper, zucchini and carrot embedded in its well-scallioned custard, fried crisp around the edges. (Its soy-sesame dipping sauce is too salty. Use it sparingly.) The Korean bulgogi rolls are delicious, the nori crisp and yielding, and we like the Cinderella roll with brown rice, avocado, and the salty-pop of tobiko. There is, of course, more than sushi here. You can find traditional Korean and Japanese dishes like bibimbap, fried katsu cutlets and sweet unagi (broiled eel on steamed rice). The japchae is listed as an appetizer, but eats like a main. Pretty on the plate, this jumble of Korean vermicelli (the chewy, translucent sweet-potato starch noodles) comes threaded with spinach, slivers of carrots, onion, peppers, a sprinkle of sesame seeds, tossed with garlic, ginger, sweetened soy and sesame. It’s delicious. The green tea cheesecake is painfully sweet. I suspect it’s brought in from somewhere. There are also ice creams — mango, green tea, coconut. We opted to order another round of rolls. At my visits, I’ve pretty much had Sushime to myself. Some customers are coming in for take out. This is a neighbourhood underserviced in Asian restaurants. I predict Sushime will become a local hero. Light some candles, dim the overheads, change the channel, and they’ll come to stay.